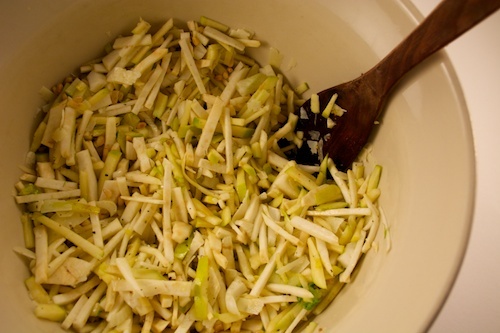 Celery root and Granny Smith slaw has been on my to-make list for ages. A big block of Kirkland Signature Manchego along with a big celery root and several Granny Smiths waiting in the produce drawer nudged me to finally get it done. 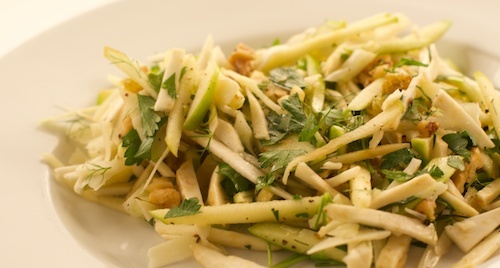 I liked the looks of Mindy Fox’s Celery Root-Apple Slaw with Pecorino, Parsley, and Pine Nuts, and after a couple of tries to create something I really liked, adding fennel, walnuts, golden raisins and Manchego along the way, here it is! I made a portion without cheese for a vegan guest and it was good as is. 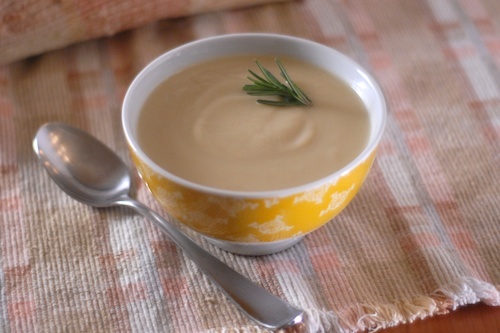 For the vegan version I’d also like to try adding Dijon mustard to the dressing using the method in this recipe from Gourmande in the Kitchen. This type of recipe takes a lot of chopping or else some mechanical help like a Cuisinart with a julienne blade or perhaps a Saladmaster machine or the equivalent. I’ve hinted at a used Saladmaster machine for Mother’s Day. Meanwhile a recipe like this takes a lot of time to chop and is one I’d save for a leisurely weekend or special occasion. 1 bulb of fennel (about 7 oz. ), core removed, stems and fronds removed, cut into small thin pieces. Fronds can also be minced and added. 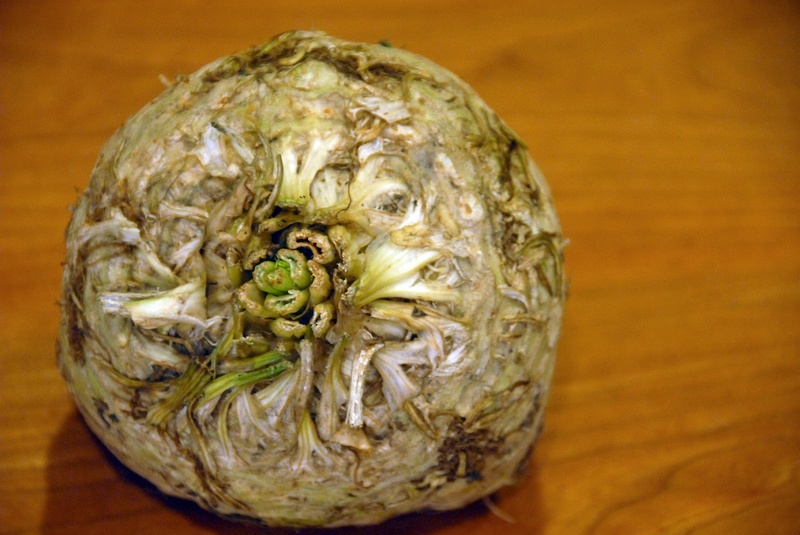 The celery root is most easily peeled with a sharp knife, not a peeler. The center of the celery root is pithy, you will want to discard it. For a small celery root quarter it and remove the center as you would cut the middle from an apple. Julienne the rest of the celery root. Cut top of fennel (reserve), quarter bulb, remove tough center from each quarter. Cut the remainder of the fennel into thin pieces. 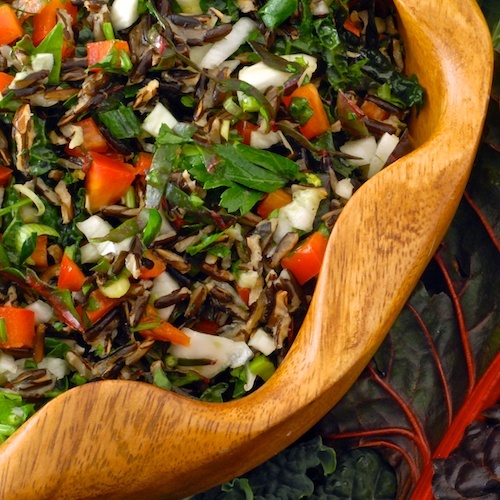 You can mince the feathery fronds of the fennel and add those in, too. Leave skin on apples. Core, quarter, julienne. Ideally you want to end up with about the same quantity of vegetables, celery root plus fennel, as of apple. I had about six cups of each once julienned. Toast the walnuts in a dry pan over medium heat for several minutes, stirring constantly, until they become fragrant and begin to brown. Place the prepared vegetables (saving a little parsley and perhaps fennel fronds for a garnish), the cheese, the raisins, and the toasted nuts in a large bowl. Add the olive oil, vinegar, salt and pepper, mix. Adjust as desired with more spices, vinegar, or oil. Top with the reserved parsley. Serve, can go on dinner plates alongside the entrée. 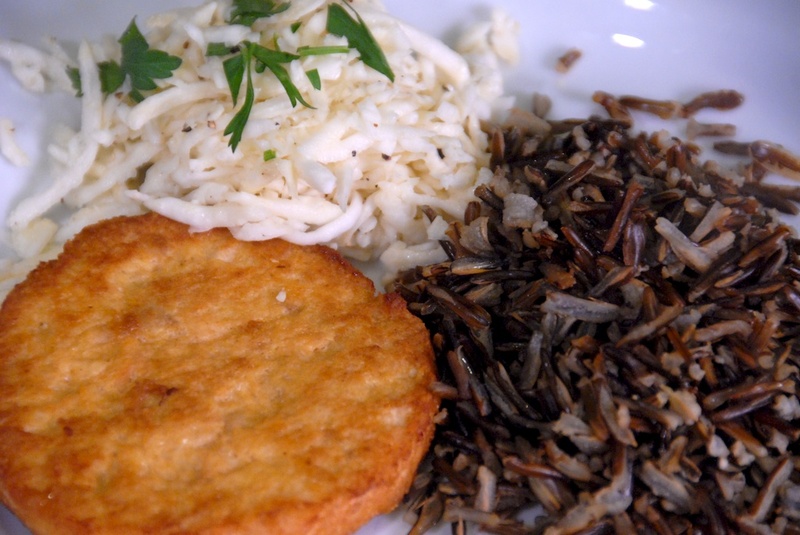 Celery Root Slaw A crunchy winter slaw using celery root, a nice alternative to cabbage coleslaw. This looks pretty darn amazing. What a great mix of ingredients. Thanks for sharing!